Fourth Row Center: Film Writings by Jason Bailey: In Theaters: "The Rite"
The first big scare of The Rite is provided by a screeching cat, who jumps up as our hero peers through a window. That should serve as a barometer for the originality on display here. 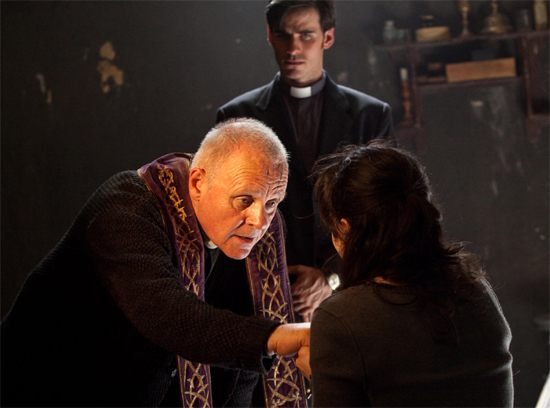 Yet another warmed-over rehash of The Exorcist, The Rite has the thrills and intelligence of a third-string direct-to-video thriller; it is distinguished only by the presence of Anthony Hopkins, in the kind of role Rutger Hauer would usually play. (Hauer instead appears in a minor supporting role.) Hopkins’s performance isn’t terribly good, but it’s fun to watch; he provides about the only diversion in this mediocre picture, which is pretty much exactly what you’d expect from its late-January release date. It doesn’t really get the unintentional laugh on paper; it’s hard to separate it from the solemn delivery of the terrible actor delivering it, but more on him later. At any rate, Michael is spirited off to a kind of Dr. Xavier’s School for Exorcists, where his primary instructor (Ciaran Hinds, lending some gravitas) worries about his rebellious attitude. He sends Michael out to the provincial cottage of Father Lucas Trevant (Hopkins), a practicing exorcist who shows him the ropes before—due to circumstances too convoluted to dive into here—becoming possessed himself. So, of course, the young skeptic must take on the possessed priest who knows all his tricks, and only one can survive, etc. To reiterate: the only reason to even consider enduring The Rite is to watch Anthony Hopkins at work, and that is a pleasure that is growing less tempting with each of these paycheck roles (he may as well have a price tag hanging off him in this one). But there is a certain charm to the way he tosses off his dialogue in these throwaway movies—the way he shrugs and says, “Yeah,” or mumbles “Bow your head, keep praying, good luck,” on the way in to his young charge’s first exorcism. Later, once he’s been possessed, he first goes into some kind of a crazy Brando act before going into the exorcism itself, which is a cackling, shoot-the-works piece of over-acting. Is it fun? Sure; he’s all but winking at the camera. But it feels strangely demeaning to watch this respected, Oscar-winning actor being put through these hack paces. And mention must be made of O’Donoghue, an Irish television actor appearing in his first (and hopefully last) major film role. It’s a ghastly performance. As an actor, he’s unforgivably wooden; the guy makes Paul Walker look connected and animated. Bland and boringly handsome, he wears the same blank expression throughout the bulk of the film—even while an exorcism is happening right in front of him. He must be a fine poker player. The Rite doesn’t make a helluva lot of sense, which might not matter if it were scary. But it’s not, because it’s not surprising—it’s the typical inventory of scare chords, snuck-up backgrounds, aggressive foley work, and even, at one point, the revelation that a scary attack was just a dream. It’s obvious when it wants to be scary and laughable when it tries to be serious; the preview audience I saw it with was giggling more than jumping. Nowhere is this more apparent than in the big showdown climax, with the two lead actors facing off in the most uneven match-up since Keanu Reeves took on Al Pacino in The Devil’s Advocate. O’Donoghue should be filling a supporting role on a CW drama, not squaring off against an Oscar winner. He only stands a chance because the game is fixed—Hopkins is acting circles around this poor schmuck. He’s fun to watch. The movie, not so much. "The Rite" opens Friday, January 28th in wide release.